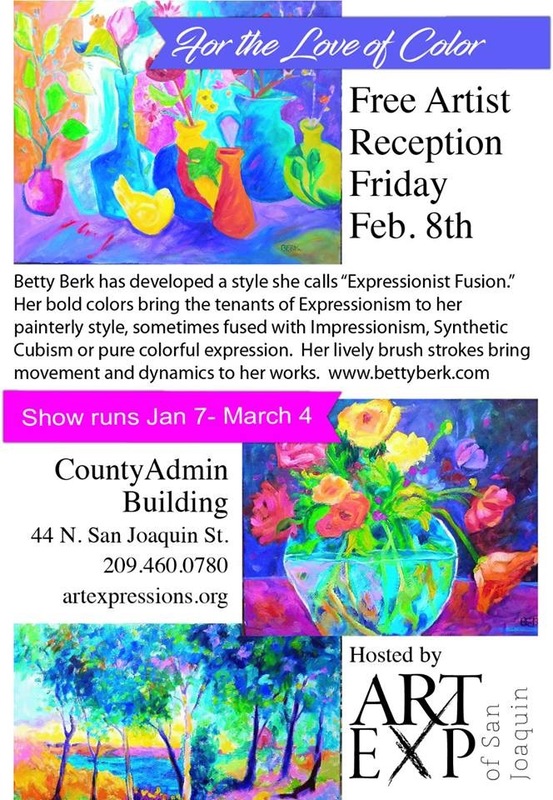 Art Expressions is proud to announce the upcoming exhibit 'For the Love of Color' by Betty Berk at the County Admin. Bldg showing Jan-Feb. Betty has developed a style she calls “Expressionist Fusion.” Her bold colors bring the tenants of Expressionism to her painterly style, sometimes fused with Impressionism, Synthetic Cubism or pure colorful expression. Her lively brush strokes bring movement and dynamics to her works. A meet the artist reception will be held exclusively on February 8 from 5 PM to 7 PM, highlighted by musical entertainment, food and beverages. Free event.